Brian PetersonHere to Help You! Rising Star by Illinois Super Lawyers Magazine in 2014, 2015 and 2016.
the legal side of your business from start to finish. that they are in compliance with your wishes. Located in Galesburg, Illinois, Simpson Peterson is a full-service civil law firm which represents clients throughout Central Illinois. We are experienced and accessible, and we deliver cost-effective solutions based on each client’s goals and objectives. Simpson Peterson is located right in the heart of Galesburg, Illinois. We are proudly a full-service civil law firm that diligently represents clients throughout the Central Illinois area. Our team of experienced attorneys is always compassionate and accessible in discussing your case. We deliver cost-effective solutions based on each client’s goals and objectives. Each case is unique, which is why we never apply boilerplate solutions. We develop a custom legal strategy to provide our clients with what they need to get a favorable resolution. Whether that is going to trial or accepting a settlement, we are prepared to do whatever it takes for our clients. This is a question that only a qualified personal injury attorney can answer after having first discussed your case with you. 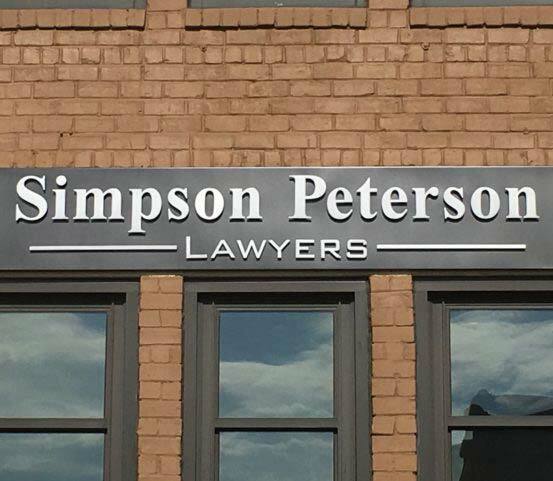 If you or a loved one has been injured as a result of what you believe to be the negligence of others, call Simpson Peterson today to discuss your case for no charge. We will meet with you at our office or at your residence, and discuss the specifics of your case to let you know if you are entitled to compensation. We offer a free consultation and there is never a fee unless you recover. At Simpson Peterson, we work on a contingency fee basis. This means that you will not pay anything for your case unless you recover money damages on your claim. If you recover damages, our contingency fee for a personal injury case is 33% of the recovery. It is crucial to understand the qualifications of the attorney representing you on your injury claim. While an attorney may say he or she will charge you only a 25% contingency fee on a personal injury case, he or she may not be qualified or competent to handle your personal injury lawsuit. As much as it takes. At Simpson Peterson, we treat each client as if he or she were our only client. We understand that it is important to get the ball rolling on your case as soon as possible. This includes performing an early and thorough investigation to obtain all of the necessary facts of your specific case and continuing to work tirelessly throughout your claim until you obtain a recovery. In Illinois, individuals generally have two years from the date of an accident to file a personal injury lawsuit. There are exceptions which can shorten or lengthen this time period. If you have been injured, it is crucial that you discuss you call Simpson Peterson as soon as possible so that you know exactly how long you have to pursue your claim. In the case of a wrongful death, financial and emotional losses caused to the decedent’s spouse, children and other dependents. In addition, punitive damages may be available under some circumstances. Will my personal injury claim go to court? How do I know if I am entitled to Workers’ Compensation benefits? Generally speaking, in Illinois if, if you are an injured at work while working in the scope of your employment for your employer than you are eligible for workers’ compensation benefits. If I get injured at work, do I need to notify my employer? Yes. In general, an injured worker is required to provide notice of his or her injury to their employer with 45 days of the accident. However, it is always to an injured worker’s advantage to provide notice as soon as possible. With repetitive trauma cases, such as carpal tunnel, it often is difficult to determine when the injury occurred in order to calculate the 45 day notice period. It is crucial you discuss your injury with an attorney in a timely manner to ensure that you are aware of the notice requirements. What benefits am I entitled to if I get injured at work? If you have been injured at work, please contact Simpson Peterson to discuss the benefits available to you. If I am not working, how do I pay my attorney? We will never charge an attorney fee unless we are successful in procuring you a settlement or trial award. In the event we are successful in getting you a settlement or trial award, Illinois law mandates that our fee cannot exceed 20% of the recovery or award.